Brushed and unfinished solid wood flooring is a perfect flooring solution for anyone who wants a blank canvas in their home. Brushing wood helps to open up the grain of each board and brings the real charm of the wood to the surface. Add to this the fact that this flooring is left unfinished and what you get when you order this option is a completely natural, solid wood flooring solution. 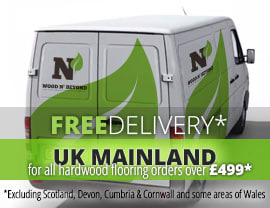 Solid wood flooring, as the name suggests is made from planks of solid wood, in this case oak, and nothing else. A style of flooring that has been in vogue for centuries, when you buy a high quality brushed and unfinished solid wood flooring option, you know you can finish it in any way you want. This makes this solution the perfect choice for anyone who’s unsure about the final finish they want. What’s more, with solid wood flooring you know you’re making an investment, because with the right care and attention, this brushed and unfinished solid wood flooring should last a lifetime and even a whole lot more!